High expansion foam systems represent the most effective protection for such specialised and severe cryogenic risks as LNG (Liquified Natural Gas) and LPG (Liquified Petroleum Gases). Angus Fire’s LNG Fixed Turbex Systems meet the extremely demanding performance requirements for this high risk application. Engineered to the highest standards for exceptional reliability and minimal maintenance, the FT1- 500P/LNG and FT2-500P/LNG Fixed Turbex Systems feature a foam making net and fan, which benefit from a special boiler grade of stainless steel designed to withstand continuous high temperatures without a reduction in material strength or risk of intergranular corrosion. The complex structure of the foam making net is specially supported to avoid distortion and the tubular support frame has holes drilled to prevent moisture build-up and relieve air expansion when heated. Special glass rope lagging insulates the water turbine and three lifting lugs are provided to assist with site installation. Rugged construction and careful choice of materials provides exceptional corrosion resistance against highly saline, humid and high temperature environments. The high efficiency design of the Angus LNG Fixed Turbex System has enabled these units to exceed the severe requirements of the National Fire Protection Association NFPA 11A Fire Exposure Test. Performance is unaffected even after exposure to temperatures up to 1000°C during the 5 minute preburn period of this test. Turbex LNG Skids are the proven high expansion foam systems solution to provide a fast and effective answer for LNG (Liquefied Natural Gas) spills in contained areas, whether vapourising or on fire. Turbex LNG Skids provide all the specialist features needed for LNG including a specially engineered skid base, LNG Turbex high expansion foam generator, plus discharge hood designed to protect the Expandol foam from wind and direct it downwards into the pit of LNG. Each LNG Turbex Skid is engineered from high performance 316 stainless steel and gunmetal materials. 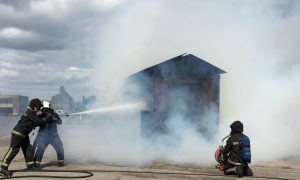 Watch here the Turbex Skids and other Angus foam, fire hose, sprinklers and Monnex in action.